This icon is from from the iconostasis of the Optina Elders Chapel at Holy Trinity Monastery. 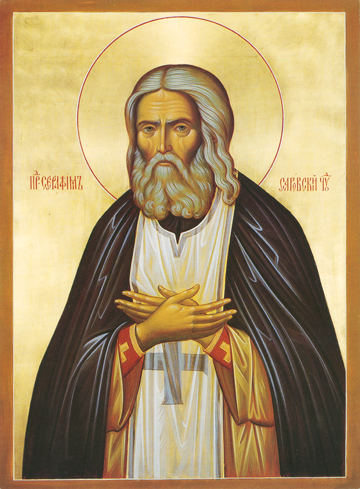 St. Seraphim was born in Kursk, Russia, in 1759 and as a young boy was healed by the wonder-working Kursk-Root icon. He entered the Sarov Monastery at 19, and excelled in prayer and ascetic life, with patience, love, and charity towards others. After ordination as a priest, he became the spiritual director of the Diveyevo Convent. He lived as a hermit for 25 years, until he was savagely beaten by a group of thieves looking for money. They left him for dead, and although he recovered, he was bent over for the rest of his life from this beating. St. Seraphim returned to the Sarov Monastery after he was so injured that the Abbot felt it would better for him to return. Soon afterwards, the Mother of God, who appeared to him several times in his life, told him to open his doors to all who would come, and a stream of visitors hungry for spiritual life and help came to him. He was the most famous staretz, or elder spiritual guide, in Russia in the 19th century. St. Seraphim shone with light, and told us the meaning of the Christian life. He died in blessed repose in 1833.